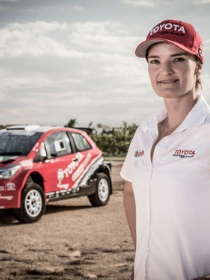 “Planning, Strategy and Execution” are the focus of Rally Navigator, Elvéne Coetzee. Elvéne has rallying in her genes. The Coetzee name is engrained in South African rally history, with Elvéne’s father a driver of note in the 70s and 80s. Elvéne, in fact, lists her most memorable rally as the 2008 Belfast Rally as navigator for her father. Elvéne’s talks are all accompanied by spectacular video footage and the roaring of powerful engines. The following year, Elvéne teamed up with Etienne Lourens in Class N3. Still moving up in her career, Elvéne joined Evan Hutchinson in 2009 in Class A7 with a Toyota RunX. The pair had a very successful year and won the Class A7 Championship. For 2010, she graduated to the S2000 Class with Hutchinson. As well as the national championship, the pair contested selected regional events as well ending the year on a high with a win in the All-Tar Rally. Their 2012 season was not a true reflection of their capabilities the season started with the low point being the total destruction of their Auris in a grass fire on the opening stage of the opening round in KwaZulu-Natal. The team found their limit and feet again and worked hard to make a positive comeback. Then came 2014 and the South African National Rally Championship, which the pair won the championship with one round the spare. Coetzee became the first female navigator to win the championship since 1960. In 2015 Elvéne made history by winning the South African Rally Navigator Championship for the second consecutive year. 2016 was no different by winning the championship with two rounds to spare Poulter and Coetzee was crowned South African Rally Car Champions, making Elvéne the most successful female navigator of all time. Together the pair has won 14 National events. Elvéne has a wide ranging interest in motorsport and started circuit racing in 2009, drag racing in 2010 and is currently navigating in the Donaldson Cross Country Championship with Australian friend Dave McShane. Elvéne also have her Springbok colours in Equestrian Tentpegging. Elvéne’s keynote yesterday was the perfect closer to a busy working session for the Nedbank Group. The team loved your session and it was really well received by the management team who took loads of notes and considerations of the synergies to their business. The perfect & inspiring closer to the day!